Even if Eros were not a part of Aphrodite’s family I think I would find him fascinating. His two best-known faces are so, so different–on one hand, the cherub, the chubby winged child; on the other, the handsome young lover of Psyche. He has two different origins in myth as well–on the one hand, as the son of Aphrodite; on the other, as a deity both primal and primordial, a force of nature who existed long before the Olympians. Even the ancients struggled with this dichotomy. This set of Eros pocket prayer beads in rhodonite consists of twelve beads, to represent the Greek dodecathon of twelve gods;there are many more than twelve Greek gods, but most cities had their own group of twelve. Joining the string is a pendant, a symbol representing the god: the winged heart. As a god of love, Eros is well represented by the heart; the wings reflect both the god’s own wings and the fleeting, ephemeral nature of love itself. 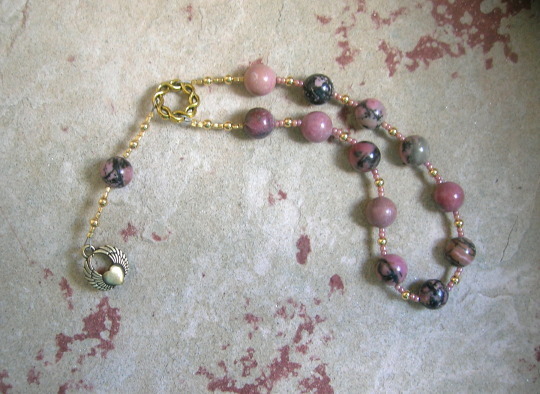 It is made with 10mm pink and black rhodonite beads, separated by gold-toned metal spacer beads, and glass seed beads to provide a comfortable transition from one bead to the next and to make the piece lightweight, supple, and easy to handle. The string itself is approximately 10.5″ (26.7cm) in circumference and is designed to be used in prayer and meditation, to decorate an altar or shrine, and/or to adorn a statue, although it may be worn loosely on the wrist as a bracelet if desired. The small size makes it easy to keep on hand in a drawer, a purse, or a pocket. The beads come with a prayer to Eros, written specifically to be used with this prayer bead design, and with a cotton muslin bag for storage. You can find them here at my Etsy shop.